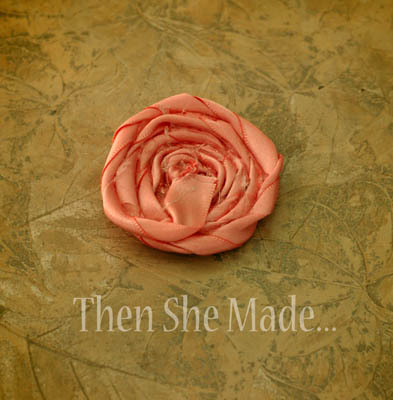 Here is the second tutorial for the flowers I've been making lately. 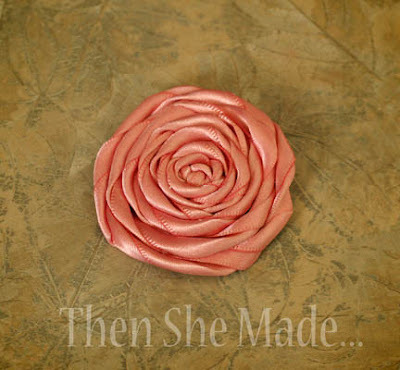 I actually started making rolled rosettes a few months ago, they are also popular in blogland. When I first started I started with frayed fabric strips and I did the two strips just like the instructions showed. However, over time, I've been perfecting the process and I like this way the best. Using ribbon is awesome and easy! Pick a ribbon color and size you love. Pretty much any size will work but I usually go with a half inch and I've found that I like satin over grosgrain. Just a personal preference though. Next cut a strip somewhere between 15 inches and 20 inches long. Then tie a knot on one end. 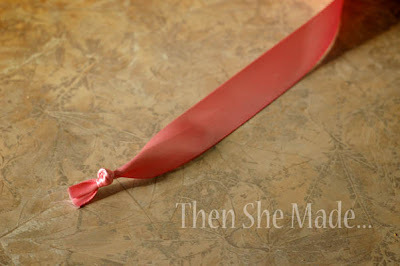 Hold the knot in one hand and start twisting the ribbon with the other hand. 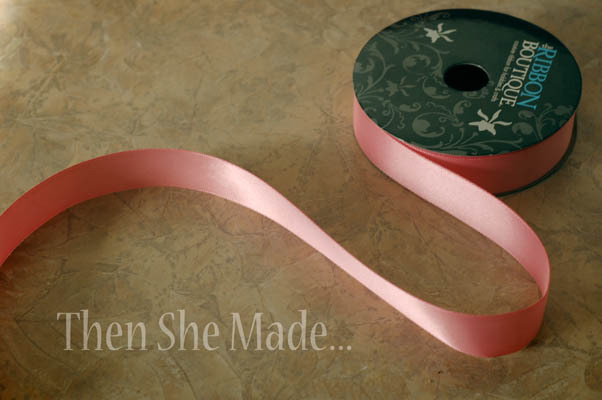 Next, while keeping the ribbon twisted, add a little bit of hot glue to the side of the knot, then wrap the twisted ribbon over and secure it to the dab of glue. Repeat those steps until your rosette is the size you prefer. When you are done twisting and gluing, you just need to take the last part of your ribbon and add some glue to the back of the rosette and glue the end piece down. Next you can adhere a small piece of fabric onto the back, this will cover the glue and give you something to attach a clip too. 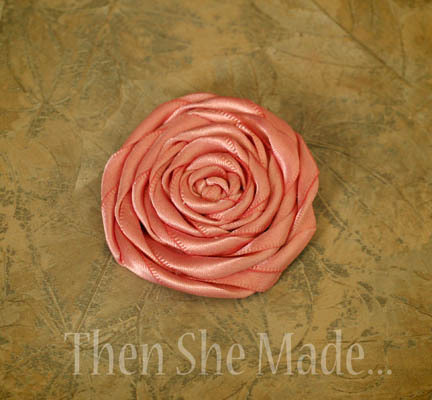 And there you have it, a very simple rolled rosette. Again, there seems to be a lot of different techniques to making these. A quick internet search will yield many options. All that I've seen are pretty close, just some little tweaks here or there in the step process. Regardless of how you make them, there are quite a few things you can do with these rosettes, I've kind of gone crazy with them. Besides hair accessories, I made a Welcome Sign, a ring, and I've decorated a bag with them. Hmmm, what I can make next? This is beautiful! I will try, hopefully will come out as good as yours! Thank you! Thanks so much for sharing this. It looks possible now and I've been obsessing over how to do one of these. I want to try some with ribbon and some with strips of material. I'm so excited. I can do this! thanks for teaching me how!!!! !